Head for the Hills! on Route 60 for eye-popping scenic views that change with each season. Scenic Vistas - Whether to see rolling pastures, mountain cliffs, water falls, fishing streams, idyllic forests and woods or the Grand Canyon of the East - New River Gorge - We Have It All! 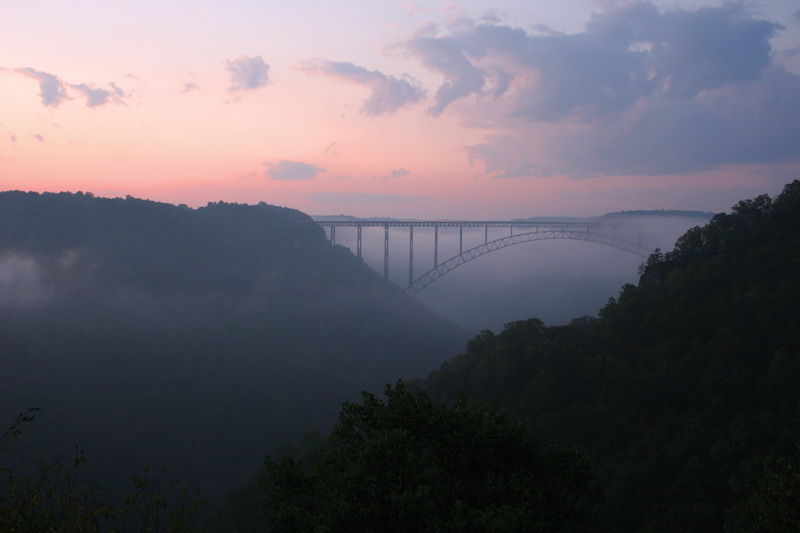 The best vista of The Grand Canyon of the East - New River Gorge is from Hawks Nest Park in Ansted. Take the short walk at Hawks Nest Roadside Park for Hawk’s Nest Overlook, Mile 46 new Mile 107, or stop at the Lodge where you can enjoy dinner while perched above the Gorge. Waterfalls - Beginning just west of Kanawha Falls and continuing to Cathedral Falls near Gauley Bridge there are over a dozen seasonal waterfalls in less than 5 miles, all visible from US 60. Cathedral Falls at Gauley Bridge, Mile 38 new Mile 91. Just east of Hico (new Mile 111) the Midland Trail curves through some of the most unspoiled scenery in WV by Babcock Park and on to the Byway's highest point Big Sewell Mountain. At the eastern base of Big Sewell, the Greenbrier Valley (Mile 85 -109, new Mile 146 -180) offers rolling pastures, a covered bridge, and beautiful farms. Drive over the world’s longest span bridge New River Gorge Bridge at the New River Gorge National Park (US 19 South from Hico). The second weekend in October the New River Gorge Bridge is closed to auto traffic and open for pedestrians and base jumpers. Fall Foliage - WV is renowned for its fiery fall foliage and Midland Trail offers the best. Capturing pictures from Fayette County is sure to please. Spring - Spring is one of the best times to visit Midland Trail. Redbuds add pink flowers to the budding trees that accent the still visible rugged landscape. By Summertime the mountains become a beautiful mass of deep greens with the foliage hiding all but the stark rock outcroppings. Winter - Icicles hanging from outcroppings of rock provide unique views on the way to WV's three ski areas - Snowshoe, Winter Place and Canaan Valley.